The Mitey Mites program is a pre-competition ski development experience designed for children ages 5-7 (based on age as of December 31st). The Mites are provided safe and fun opportunities to explore alpine and freestyle skiing in preperation for them to enter the competitive program of their choice. New Mitey Mites should have the ability to ski green and blue trails at a skill level that enables them to keep up with a group. Emphasis is placed on having fun, developing a lifelong love of the sport and building skills all at the same time. We foster healthy competition, good sportsmanship, teamwork and social interaction along with development of independence and responsibility. We encourage parents to be part of the program by talking with their children about training, upcoming events and activities. Providing positive reinforcement for your children for all Mitey Mites activities will help foster their love of skiing or riding and winter snowsports. Christina is a lifelong skier and the daughter of two ski instructors. She raced out of Hunter Mountain for six years and enjoyed every minute of it. 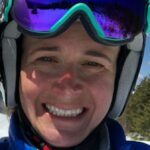 After exiting the racing world she started coaching at Hunter Mountain in their junior race program. In 2000 she moved to the Boston area and started teaching skiing at Waterville Valley in the Snow Sports Department. She is a Certified PSIA Level II instructor and a member of USSA. During the week, Christina is Special Education teacher specializing in dyslexia and reading disabilities with students from Kindergarten through fifth grade.